Member Login | Need help? Registration for this program is closed. Please contact the CASD office at (619) 696-1166 for more information. A comprehensive and up-to-date overview of People v. Sanchez and the California Supreme Court’s limitations to what hearsay may be conveyed to the jury as a basis for the expert’s opinion, as well as an analysis of applicable evidentiary foundations and Hearsay. What is hearsay and what are experts allowed to talk about? How to use Hearsay and Sanchez to get in medical records, life care plans/testimony, police reports, etc. 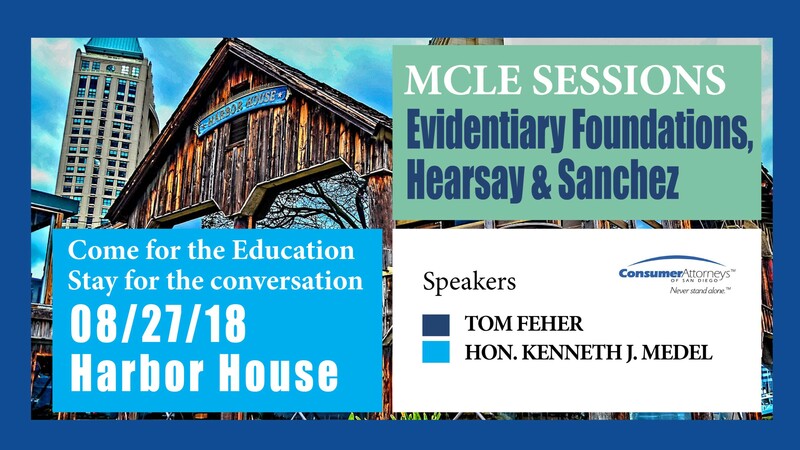 This activity has been approved for Minimum Continuing Legal Education (MCLE) by the State bar of California in the amount of 2 hours of General MCLE Credit. CASD verifies that this activity conforms to the standards for approved education prescribed by the rules and regulations of the State Bar of California governing MCLE. ©2019 Consumer Attorneys of San Diego. All rights reserved.